When the Spanish arrived in Peru, they discovered the greatest Native American empire in history, stretching from the mountains of Ecuador to the deserts of Chile and the jungles of Brazil. But, alone among history’s great empires, the Inca had no written language. Instead, they administered the empire using bundles of knotted cords known as quipus. Long dismissed as mere mnemonic aids, it’s now becoming clear that the “talking knots” were a far stranger and more advanced technology than we ever suspected. 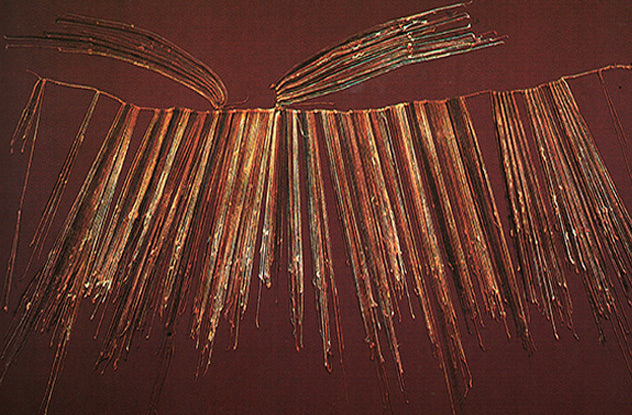 The Spanish recognized that the quipu were more formidable and accurate than their own system of record-keeping. They also realized that they were extremely important to the prestige and history of the local people. They didn’t care for either fact and declared quipu satanic in 1583, burning every example they could find. At the time, quipu were extremely common, with every village in the empire using them. Today, only around 750 examples remain. 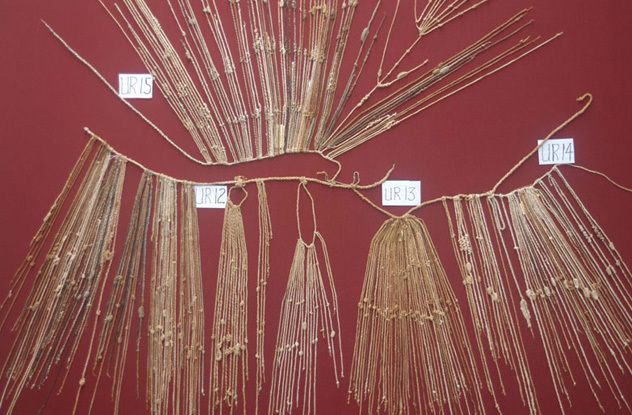 Despite their virtual eradication, many Andean people retained an enormous respect for quipu, although they lost the ability to truly read them over time. In the Peruvian village of San Cristobal de Rapaz, the locals carefully preserve a quipu in a ceremonial “quipu house” that must be approached with offerings and invocations. They regard the ancient record as a holy object that allows them to communicate with the nearby mountains, which allow the rain to come in their time of need. Until recently, Western historians dismissed the quipu as numerical records, barely more advanced than abacuses. But early Spanish chroniclers frequently referred to the quipu as containing words as well. It took an unusual combination to overturn the consensus. Robert and Marcia Ascher were a married couple who also happened to be an archaeologist and a distinguished mathematician. In the 1980s, they teamed up to analyze the quipu and confirmed that at least a fifth of them had “non-arithmetical” elements. This was huge, because if quipus are hiding a writing system, then it’s one like no other in the history of the world. For one thing, it’s three-dimensional. For another, the quipus don’t seem to represent sounds, so the Inca developed a notation system entirely separate from their spoken language, perhaps like computer binary (more on that later). But before all of that, let’s get down to basics. How did the quipu work? 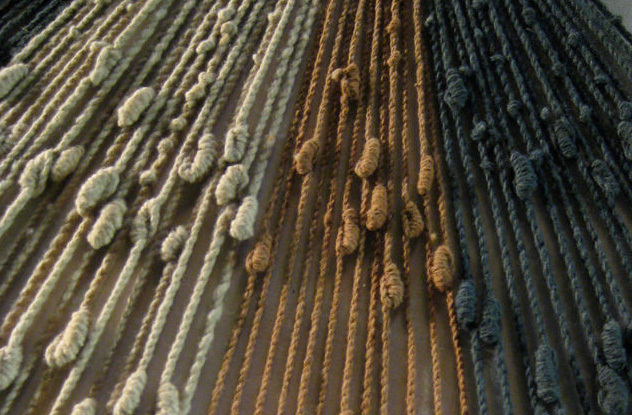 The most straightforward use of the quipu was to record numbers using clusters of knots. These are relatively easy to decipher, since the Inca used a base-10 positional number system much like the one we use today. In our system, the symbol “5” can represent the number five or 50 or 5,000 depending on its position. In the number “555,” the digit 5 stands for the number five in the first column, the number 50 in the second column, and the number 500 in the third column. In this way, we can represent very large numbers using only 10 symbols (0 to 9). 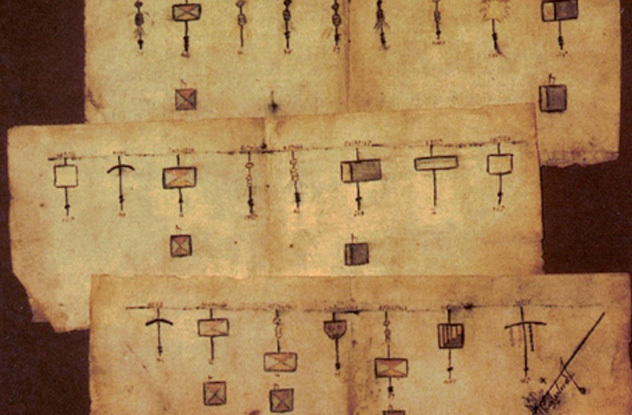 The Inca had a similar system, in which the value of a cluster of knots changed depending on its position on the cord. So a tight cluster of three knots by itself represented the number three. But a cluster of three knots followed by a second cluster of three knots represented the number 33 (rather than simply adding up to 6). So the number 431 would be recorded on a quipu as four knots pressed together, followed by three knots clustered together, followed by a single knot at the end. All cultures have the concept of nothing, but the actual use of zero as a number was one of the most important breakthroughs in mathematics. The concept was considered so startling that in 1299, the Italian city of Florence banned Hindu-Arabic numerals such as zero entirely. The Romans lacked zero and consequently had to use a complicated system with symbols for 10, 50, 100, and so on. So in Roman numerals, 70 was written as LXX (50 plus 10 plus 10). The number 1939 had to be written as the deranged MCMXXXIX, which works out to 1,000 plus [1,000 minus 100] plus 10 plus 10 plus 10 plus [10 minus 1]. This made basic math ridiculously hard—-compare teaching a child to add LXXXI to XL to teaching 40 plus 81. Inca math was advanced enough to include placeholder zero, which they represented as a space with no knots. So 209 would be indicated by two knots, followed by a space (0), followed by a clump of nine knots. This meant that the knots had to be exactly spaced so that it was easy to see when a space stood for zero. Quipus also had multiple levels. The basic design of a quipu was a thick horizontal rope with smaller strings hanging from it. 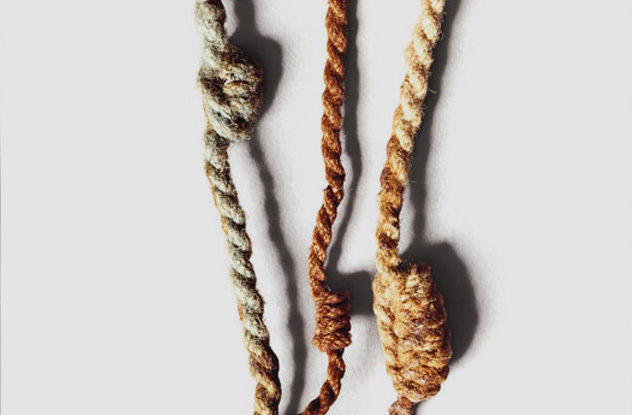 These are known as pendant cords. However, some cords were attached on the opposite side of the central rope. These are known as top cords and often seem to contain the sum totals of the numbers being collected on the pendant cords below. Top cords and pendant cords can be seen clearly in the image above. Additionally, smaller strings could be tied to top cords and pendant cords. These are known as subsidiary cords and contained supplementary information to the main cord. If you scroll back up to the previous entry, you can see subsidiary cords in the top right of the image. Between pendant cords, top cords, and subsidiary cords, quipus were extremely complicated devices. And we’re only just getting started. Space was also used, with groups of cords representing a particular location or category. In the image above, you can clearly see that the pendant cords are separated into groups with spaces in between them. 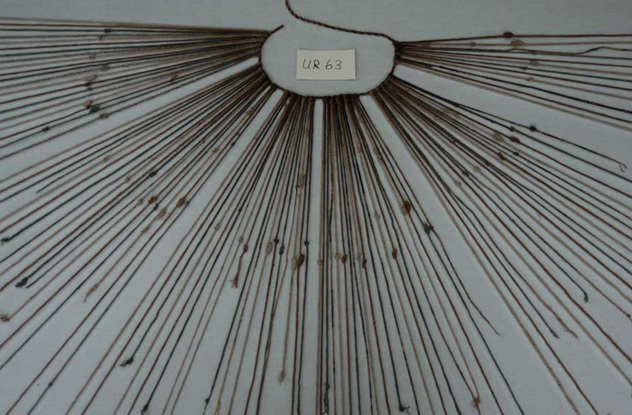 If the Inca wanted to know how many weapons their army had, then each group of cords might represent a regiment, with a different color of cord for every type of weapon. Or let’s say the Inca wanted to know how many animals had been born in a village that year. Each group of cords would represent the animals owned by one particular family. Red cords would represent llamas, green cords alpacas, and brown cords guinea pigs. The knots on each cord would be the number of animals born that year. If there was no red cord in a group, it would mean that family didn’t own llamas. If there was a red cord, but it had no knots, it would mean the family had llamas, but they didn’t give birth that year. Think back to the examples from the last entry. We have seen how the quipu could be used to record complex numerical information, but surely it’s not much use to record that a regiment is low on javelins without recording the name of the regiment? Traditionally, it was assumed that the Inca simply had to remember that information, since the quipu could only record numbers. But it’s now all but certain that the quipu could record at least some non-numerical information. As well as colors and space, the Inca used at least three different types of knots to encode data. A figure eight knot was used to indicate that it was the last digit in a number, a bit like a numerical full stop. 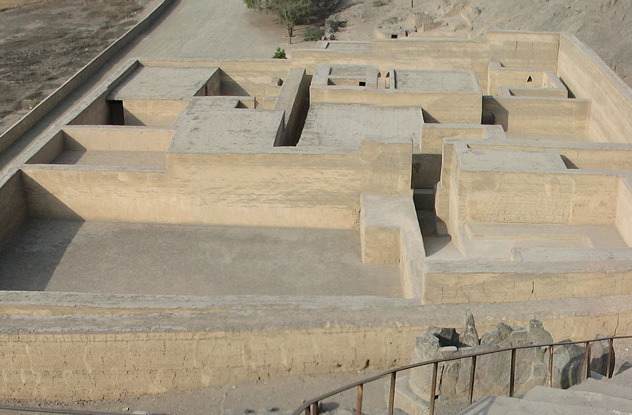 In the 1950s, a treasure trove of preserved quipus was found at an Inca administrative center called Puruchuco. Some of the quipus clearly summarize the numbers found on other, larger quipus. It’s likely that these summary quipus were intended as reports to be sent to the Inca capital at Cuzco. Interestingly, the summary quipus always start with a single cord containing three figure eight knots. Since figure eight knots indicate the last digit, three figure eights in a row don’t make sense as a number. Quipu researchers like Gary Urton now believe that the three knots represent the place name “Puruchuco.” This is the first non-numerical information decoded from quipus. It is likely that other such “zip codes” exist for locations throughout the empire, but they are likely less easy to detect than Puruchuco’s clearly non-numeric figure eight knots. Quipus had other elements that probably helped give them meaning. Garcilaso de la Vega specifically mentions the thickness of the cords, but we don’t know exactly what that meant. Additionally, researchers have focused on the material used (cotton or wool) and the style of weaving the cords (two distinct patterns known as S-spun and Z-spun). These might be meaningless, but the distribution of S-spun and Z-spun cords does seem unusual enough that it might not be random. Gary Urton, a leading quipu researcher, has suggested that the Inca used a binary code similar to modern computer binary. According to Urton, each quipu represents a series of seven binary choices (for example, cotton vs wool and S-spun thread vs Z-spun thread). Combined with color, Urton argues that this allows quipus to indicate up to 1,500 distinct arrays—-far more than Egyptian hieroglyphs—-and therefore contain lengthy narratives, much in the same way that computers can encode whole books in a series of zeroes and ones. Urton is at pains to emphasize that the binary code is just a theory and it hasn’t gained wide acceptance among his peers. Notably, it’s not clear how the binary code reconciles with the decimal numbers we know are definitely recorded by the quipus. 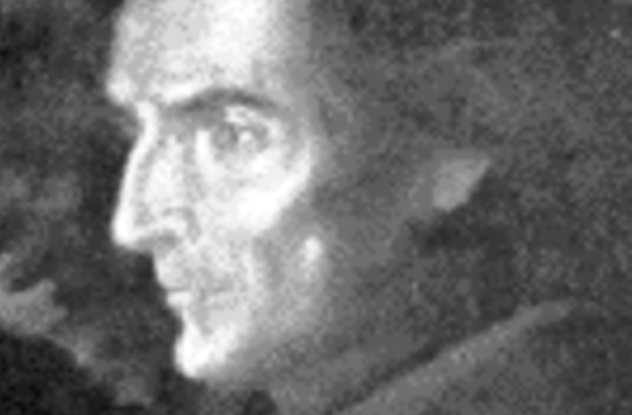 In 1996, an Italian historian named Clara Miccinelli claimed to have made an amazing discovery in the archives of her noble Neapolitan ancestors. A book written by 17th century Jesuits made several startling revelations about the conquest of Peru. Among other things, the book claimed that several “royal quipus” were actually written in a forgotten syllabic language. 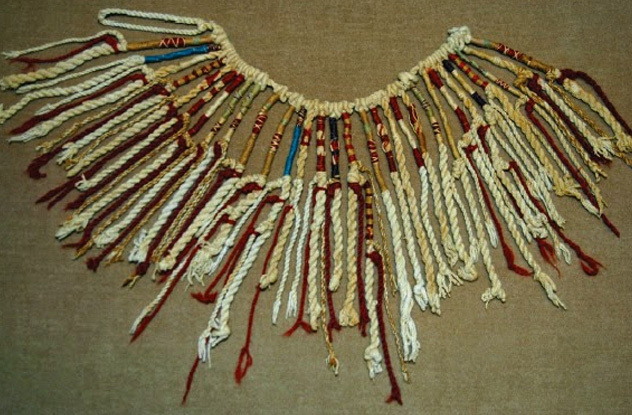 According to the book, each thread on a royal quipu began with a knot or symbol indicating a particular deity. The thread then contained a number indicating a syllable in the god’s name. It specifically cites the god Pachacamac, saying that his symbol followed by one knot is the syllable “pa,” while two knots is the syllable “cha” and three knots would be “ca.” In this way, it would have been possible to write a short story or song across a full quipu. Unfortunately, most mainstream historians suspect that the book is a forgery, since it makes several outlandish claims, including that Francisco Pizarro conquered the Inca via some nefariously poisoned wine. It also uses the term “genocide” to describe the conquest, even though that word wasn’t invented until several hundred years later. Clara Miccinelli, who was known for somewhat eccentric scholarly interests, has largely refused to release her documents for careful study and testing, leaving the royal quipu theory unsubstantiated. In days gone by, historians used to refer to the “paradox” that the Inca alone managed to build a giant empire without any form of writing to administer it. 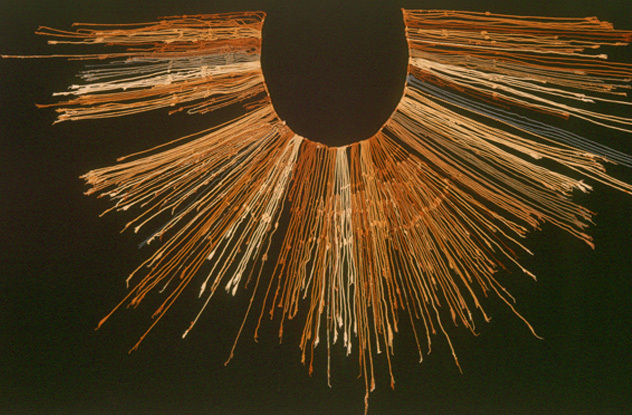 But it’s now clear that the quipu were more than up to the task. Whatever else they were, the quipu were a terrifyingly complex apparatus: pendant threads, top threads, subsidiary threads, knot styles, weaving style, cord thickness, color, spaces, and unknowable other factors combined to create a strange nexus of information which we may not even have the tools to understand. The Inca were an empire built on textiles and the quipu were arguably their finest work. We know from the Puruchuco quipu that they contained at least a few words. But even if that was as far as it went, they were still incredible devices, allowing for complicated arithmetic and a system of record keeping that rivaled any in the world.